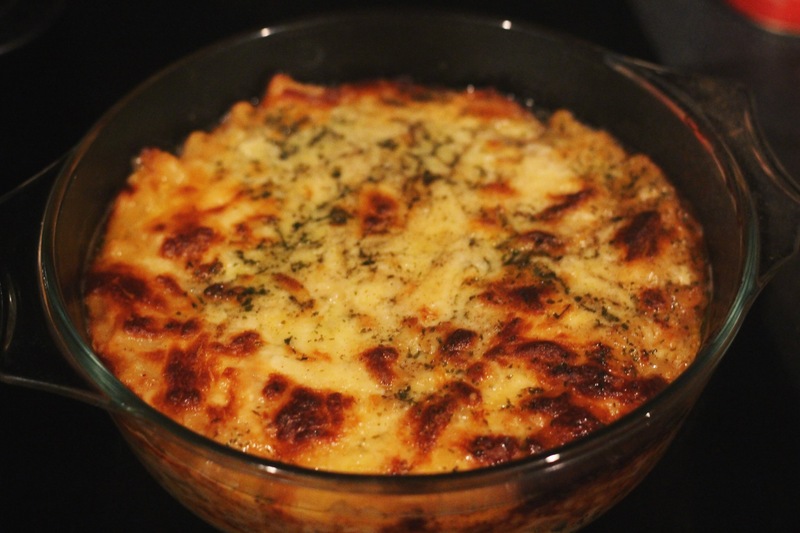 It was early one Sunday afternoon that I suddenly had a craving for some super cheesy macaroni cheese. I’d had a first attempt at it when I cooked the dish for my graduation BBQ back in July. But with the hustle and bustle that comes with hosting a party, I never really took the time to enjoy it myself. 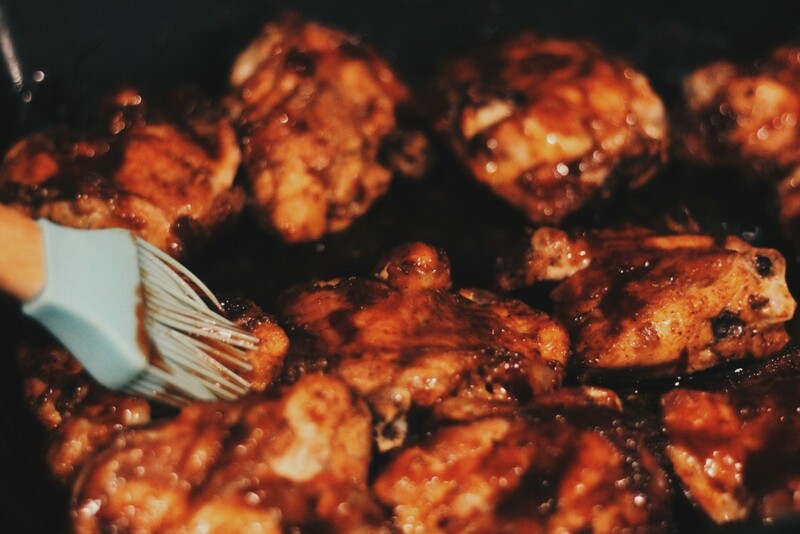 So I decided I’d make it again and serve it with some BBQ chicken, something a little different to the way we usually prepare chicken at home. First, pre-heat the oven to 180C. Season your chicken pieces (I used thighs because they’re nice and juicy) with the dry seasoning. I didn’t put measurements since I always just do this freely and generously. Make sure all the chicken is covered well. 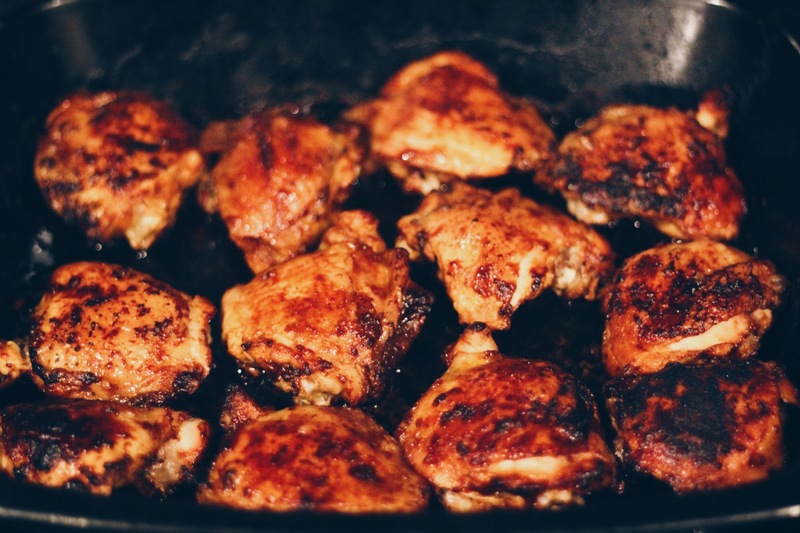 Once seasoned, pour some olive oil all over the chicken and place in the oven. 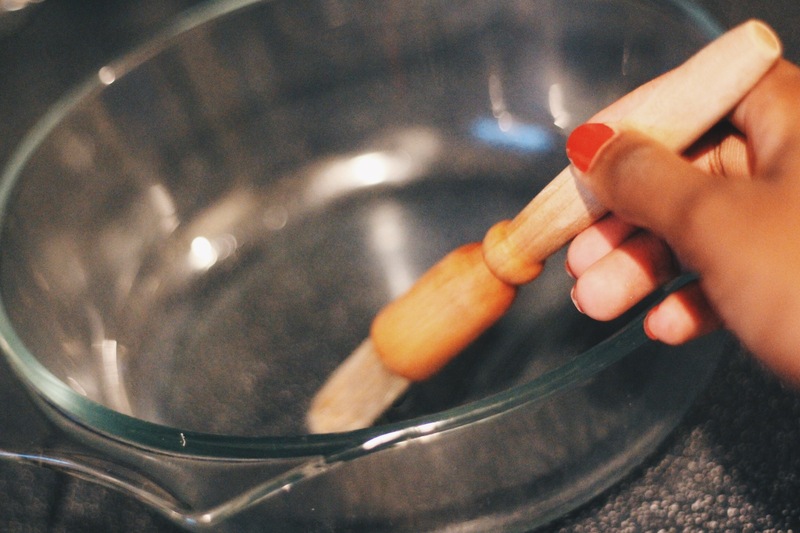 Next, put a pot of water on the stove to boil for your pasta. In the meantime, finely chop the onion and garlic cloves. In a hot pan, melt a generous helping of butter (approx. 2tbsp) and cook the onions and garlic until soft. Add the flour, followed by the milk, bit by bit to avoid any lumps. Fun fact: I actually used soya milk since we don’t drink cow’s milk in my house but it worked just the same! You may need to adjust the mixture at this point i.e. add more milk/butter/flour, to ensure you have a thick creamy consistency. Next, add roughly 2tsp of nutmeg and mustard (adjust to your preference as I ended up adding lots more!) 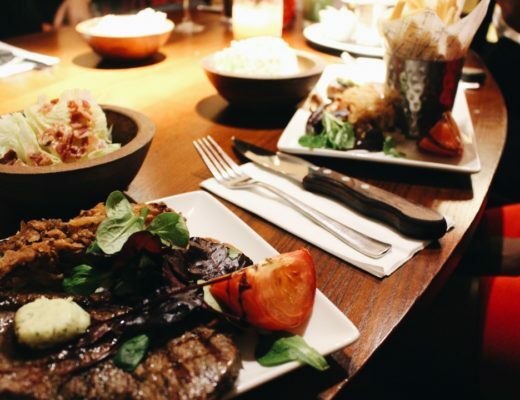 and salt & pepper to taste. 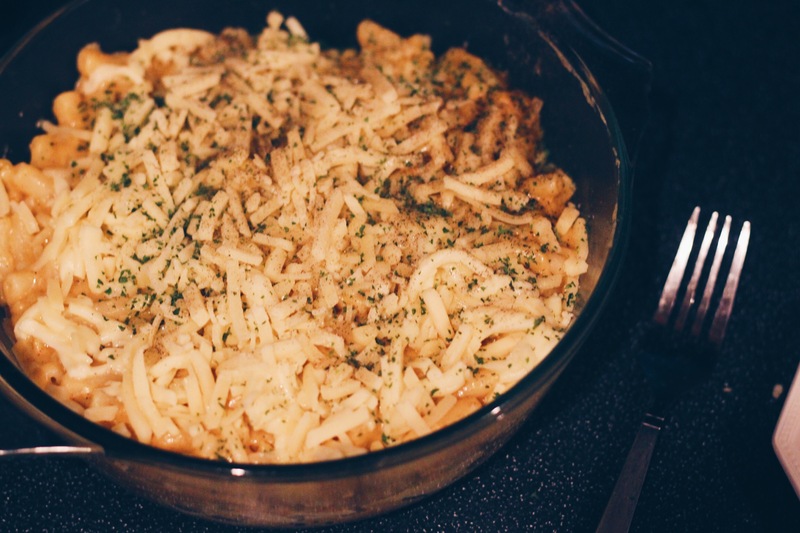 When you’re happy with the consistency of the sauce, add roughly half of each of the cheeses. 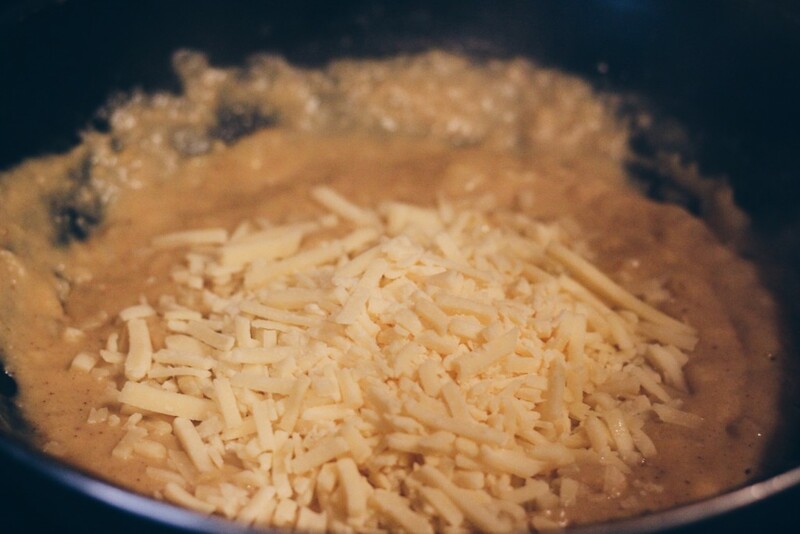 Stir well until the cheese is melted and leave to simmer. 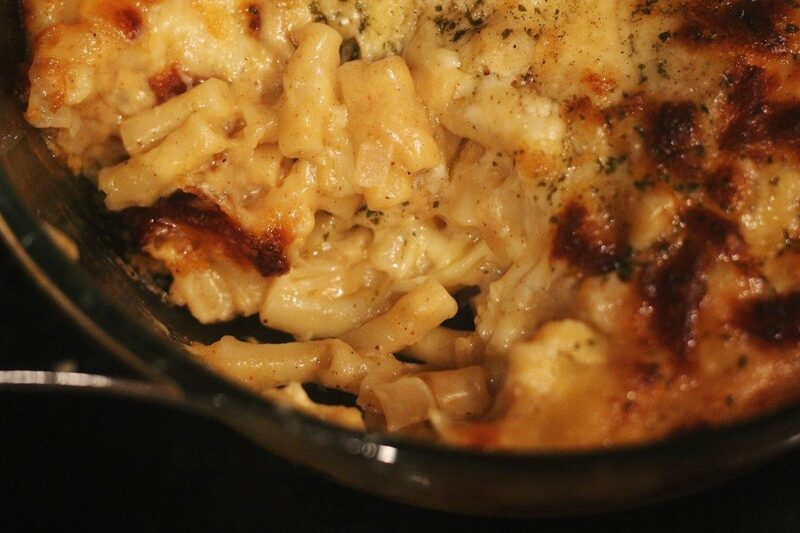 Whilst cooking the sauce, you can boil the macaroni. Cook for approximately 12 minutes or until al dente. You don’t want to overcook it or it won’t hold the sauce well. Drain the pasta and fold into the cheese sauce ensuring it’s evenly distributed. 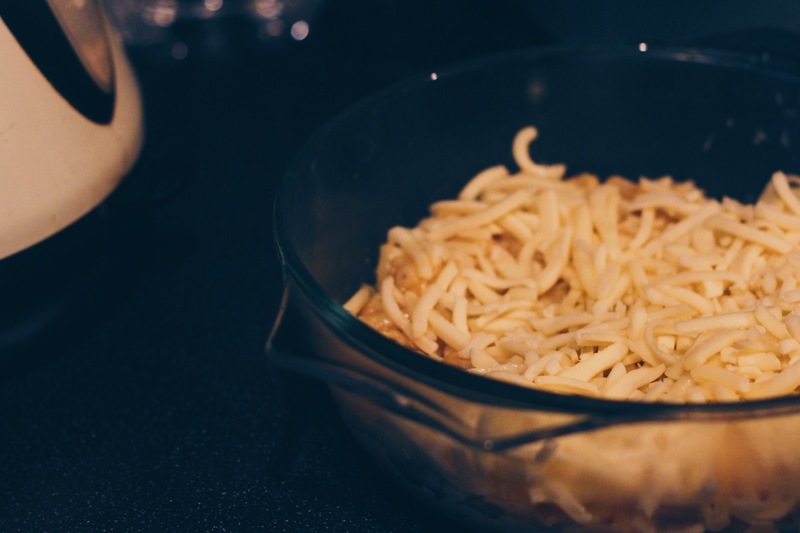 Grease the dish you wish to use with butter and pour half of the pasta mixture into it. Next, layer half of the remaining cheese on top of the pasta. Add the rest of the pasta and finish with the rest of the cheese on top. Sprinkle with parsley and place in the oven. 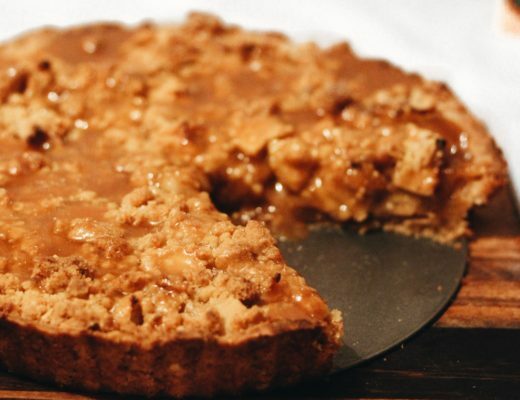 NB: If you want a super crispy top, add a generous sprinkle of breadcrumbs on the top too. At this point, the chicken should be about halfway cooked. 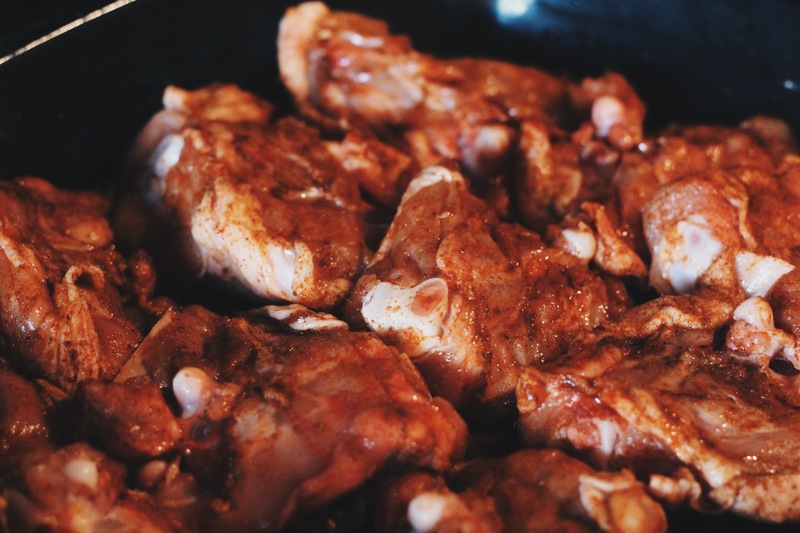 Cover it very generously in BBQ sauce, making sure all sides are covered. 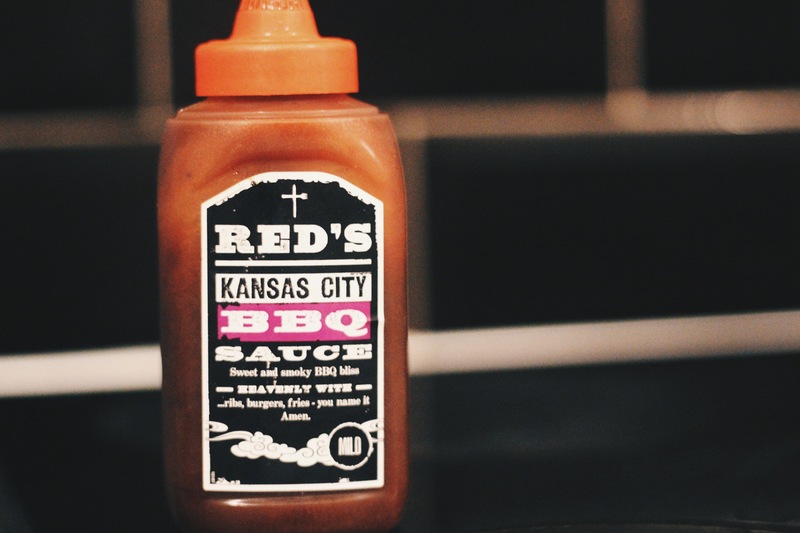 I used my personal favourite – Red’s Kansas City BBQ Sauce (used at Red’s True BBQ restaurants)- really smoky and full of flavour. Place back in the oven for roughly another 30 minutes, regularly turning the chicken over and adding more sauce if you need to. 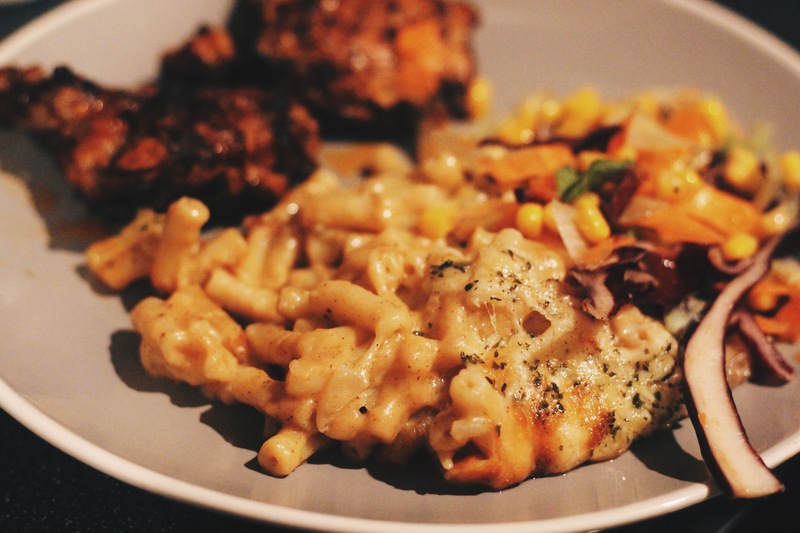 If you find your macaroni has cooked before the chicken, simply cover it and keep it warming in the oven. 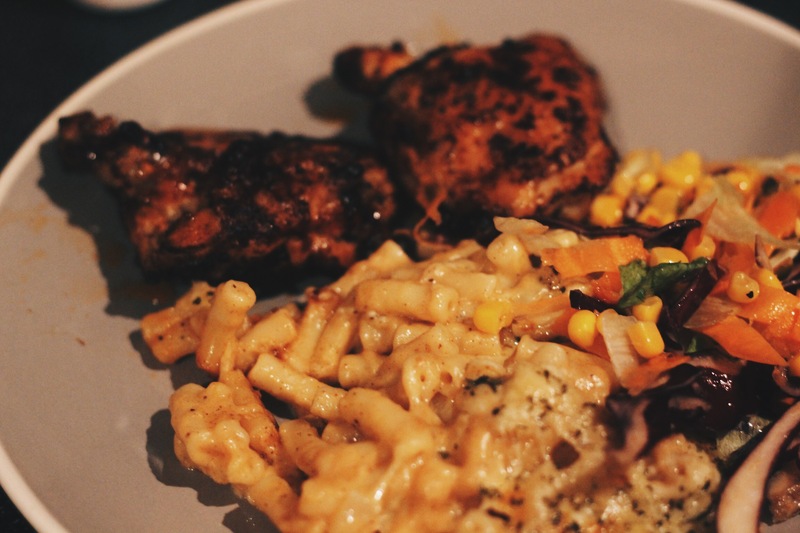 The end result should be deliciously sticky BBQ chicken and golden bubbling macaroni cheese. Serve immediately while still hot with a simple side salad and voilà. 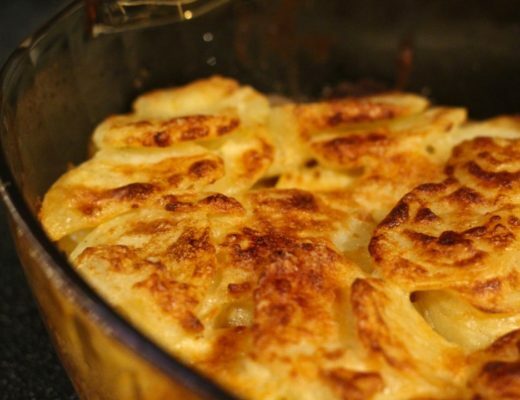 As always, if you do have a go at this recipe, let me know how you find it and tag me in your pictures – @oliviazao on Twitter and Instagram. Happy cooking!